In my role as Community Building Intern at Mozilla this summer, my goal has been to be explicit about how community building works so that people both internal and external to Mozilla can better understand and build upon this knowledge. This requires one of my favorite talents: connecting what emerges and making it a thing. We all experience this when we’ve been so immersed in something that we begin to notice patterns – our brains like to connect. One of my mentors, Dia Bondi, experienced this with her 21 Things, which she created during her time as a speech coach and still uses today in her work. The edge requires coordination from community. The center requires internal champions. 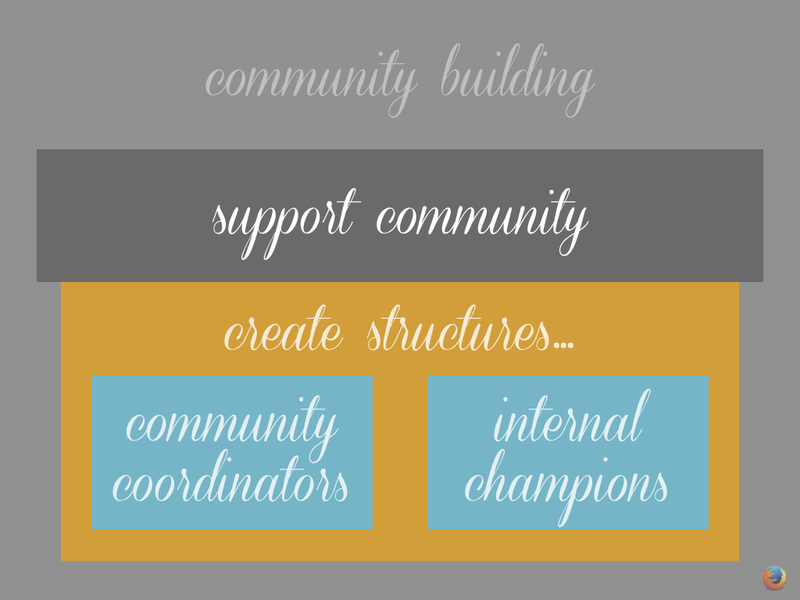 The goal of community building is then to support community by creating structures that bridge community coordinators and internal champions while independently being or supporting the development of both. This structure allows for more action and creativity than no structure at all – a fundamental of design school. Below is a model of community management. We see this theme of furthest edge to deepest middle. “It’s broken” is the edge. “I can do something about it” approaches the middle. This model shows how to take action and make the pathway from edge to middle easier. Community building is connecting the furthest edge to the deepest middle. It’s implicit. It’s obvious. But, when we can be explicit and talk about it we can figure out where and how to improve what works and focus less on what does not.